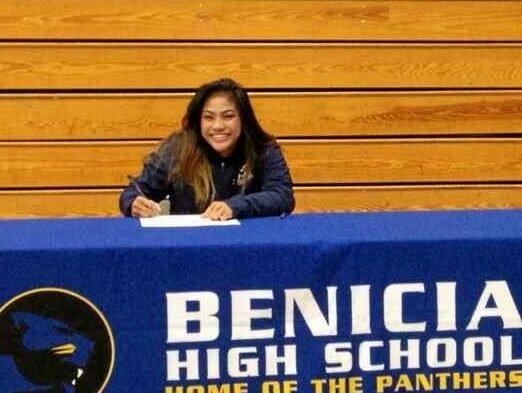 Benicia High School senior Shelly Avelino smiles Friday after signing a letter of intent to wrestle at Menlo College in Atherton. Menlo College head women’s wrestling coach Joey Bareng was interested in Shelly Avelino as early as her junior year. But when Avelino signed with the small school in Atherton as a senior, she did so as a state champion. Avelino, 17, made her commitment official Friday morning by signing a letter of intent just a few weeks removed from grabbing the CIF State Championship in Visalia. The senior pinned Westminister’s Aine Drury in the second round to win the state title in the 137-pound division. It was Benicia’s second state title in wrestling in school history. Athletic director and girls wrestling coach Craig Holden talked about what it was like to coach Avelino for four years. Holden said Avelino’s record over those four seasons was 105-9. Avelino also highly considered King University in Tennessee but ultimately chose the college a little closer to home. The senior said she likely would drop down in weight classes in college. She doesn’t consider maintaining or dropping weight to be a big deal. Avelino isn’t completely decided on what she is going to study but is considering history or psychology. She likes the area around Menlo, saying it was a little bit similar to Benicia. Bareng was pleased to have Avelino come aboard. The Oaks finished in fifth place finish at nationals in Oklahoma in February and had six different individuals place and earn All-American status.